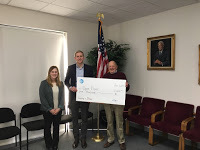 Dixon… State Representative Tom Demmer (R-Dixon) joined AT&T to recognize Kreider Services and Open Door Rehabilitation Center with “Investing in Illinois” awards for their work to help people in Illinois. 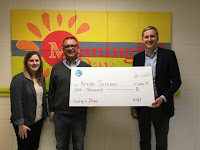 Kreider Services, a non-profit organization, will receive $1,000 from AT&T to be used to support people with developmental and intellectual disabilities reach their fullest potential. Open Door Rehabilitation Center, a non-profit organization, will receive $1,000 to be used to support transportation for adults with intellectual and developmental disabilities. Representative Tom Demmer nominated Kreider Services and Open Door Rehabilitation Center for the recognition from AT&T Illinois. The AT&T “Investing in Illinois” awards provide resources and recognition to organizations and programs that improve lives in their communities and the state. They’re advancing education, economic growth, new technologies, and other essential community services. “These are great community organizations that are helping people at the ground level. I was honored to nominate them for this award and am grateful to AT&T for providing this opportunity,” said Rep. Demmer. The company also highlighted Digital You, its resource to help teach beginners of all ages. It helps users with the basics of using a smartphone or tablet and keeping online information private and secure. It also helps users with disabilities activate accessibility features through training resources and tips sheets.